BACKGROUND: A certain proportion of patients with locally advanced rectal cancer experience complete response after undergoing neoadjuvant chemoradiotherapy. These patients might be suitable for a conservative “watch and wait” approach, avoiding high-morbidity surgery. Texture analysis is a new modality that can assess heterogeneity in medical images by statistically analyzing gray-level intensities on a pixel-by-pixel basis. This study hypothesizes that texture analysis of magnetic resonance images can identify patients with a complete response. OBJECTIVE: This study aims to determine whether texture analysis of magnetic resonance images as a quantitative imaging biomarker can accurately identify patients with complete response. DESIGN: This is a retrospective diagnostic accuracy study. SETTINGS: This study was conducted at Colchester General Hospital, January 2003 to 2014. PATIENTS: All patients diagnosed with locally advanced rectal cancer who underwent long-course chemoradiotherapy had a posttreatment magnetic resonance scan and underwent surgery are included. INTERVENTION: Texture analysis was extracted from T2-weighted magnetic resonance images of the rectal cancer. MAIN OUTCOME MEASURES: Textural features that are able to identify complete responders were identified by a Mann-Whitney U test. Their diagnostic accuracy in identifying complete responders was determined by the area under the receiver operator characteristics curve. Cutoff values were determined by the Youden index. Pathology was the standard of reference. 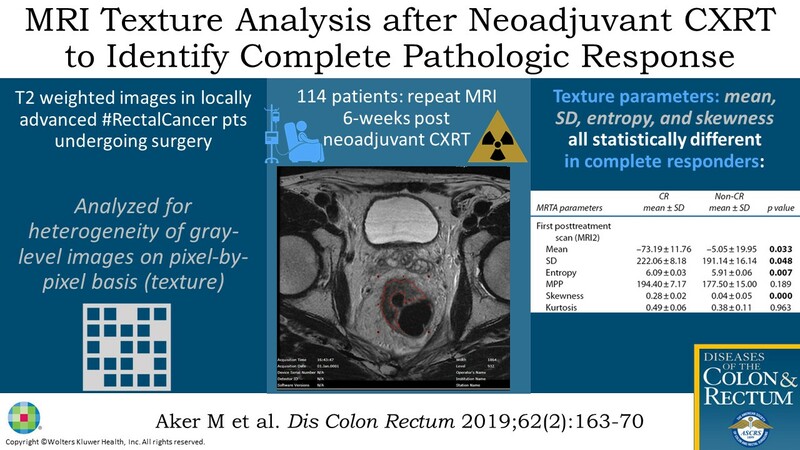 RESULTS: One hundred fourteen patients with first posttreatment MRI scans (6.2 weeks after completion of neoadjuvant treatment) were included. Sixty-eight patients had a second posttreatment scan (10.4 weeks). With no filtration, mean (p = 0.033), SD (p = 0.048), entropy (p = 0.007), and skewness (p = 0.000) from first posttreatment scans, and SD (p = 0.042), entropy (p = 0.014), mean of positive pixels (p = 0.032), and skewness (p = 0.000) from second posttreatment scans were all able to identify complete response. Area under the curve ranged from 0.750 to 0.88. LIMITATIONS: Texture analysis of MRI is a new modality; therefore, further studies are necessary to standardize the methodology of extraction of texture features, timing of scans, and acquisition parameters. CONCLUSIONS: Texture analysis of MRI is a potentially significant imaging biomarker that can accurately identify patients who have experienced complete response and might be suitable for a nonsurgical approach. (Cinicaltrials.gov:NCT02439086). See Video Abstract at http://links.lww.com/DCR/A760. Financial Disclosures: Dr Ganeshan is a director and shareholder of Feedback Plc (Cambridge, UK), a company that develops and markets Tex-RAD texture analysis algorithm software described in this article. Podium presentation at the meeting of The American Society of Colon and Rectal Surgeons, Seattle WA, June 10 to 14, 2017. Correspondence: Medhat Aker, M.B.B.S., M.Ch., M.D.(Res. ), ICENI Centre, Colchester General Hospital, Colchester, CO4 5JL UK. E-mail:medaker@gmail.com. Diseases of the Colon & Rectum62(2):163-170, February 2019.